Am I being harsh giving the storyline only 2 stars? I don't think so. I really wanted this book to be good and I hold out hope for the future. However this one fell short of the mark. The book is in two parts. There are no plot spoilers here, but what we have is very much a game of two halves. The first problem I had was with the authors writing one of the lead characters in the second person and monotonously tell you that "you are Tom", when you blatantly are not. It just did not work for me. That, along with the ridiculous counter-contradictory dialogue (the best way I can describe it) just meant the whole thing rapidly became a tedious mess. I can well understand why another reviewer gave up at this point. I nearly did too. I was genuinely thankful for part 2. The second part is, on the whole, pretty good. There are some elements that are disturbingly Star Wars-ish and the writers would do well to avoid that. But against that was the way the authors cleverly switched the points from which the battles were reported. Without doubt part 2 is better written, giving RC Bray far more to work with. Once again Bray brings his A game and steers us through. Clearly we are set up for another book. Hopefully, when it arrives we will look back at Galaxy Edge 2 as the weak platform for an outstanding sequel. Nah, Nope...No more. Tried parts 1 and 2. I wanted to like these, as I'm desperate for a decent sci-fi series to get in to. My hope was that book 2 would be an improvement on the 1st. Sadly, I don't think that's the case. Characters are so one dimensional they barely deserve names. The political scenario is simplistic and non-sensical. in short; a list of names and a series of events. The series just keeps getting better! 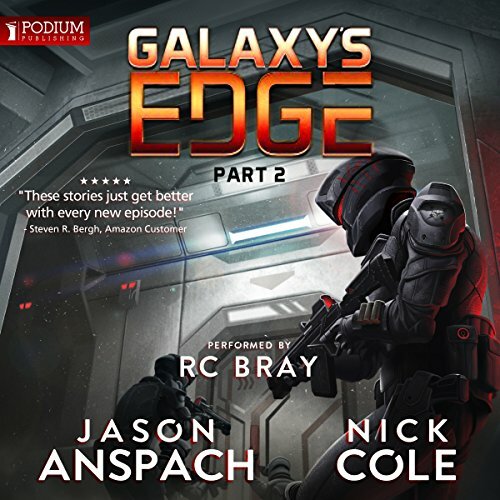 R.C.Bray's narration is 1st class as always, bringing the story and characters to life. The Space Battle scenes rank among the best In Science Fiction and this is an absolute must for any fan! At first it seemed like this book is al slow in getting started, but then it really gets going. a good space battle sci-fi. 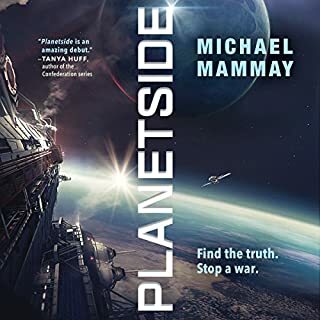 if you like space war stories, this series is for you. It was very interesting to listen. I liked the story being told from different person perspective and detailed timing of events, now I how long the space battle takes time. Maybe slightly to much detail for somebody who's first language is not English, but replay button helped tackle this slight "issue". 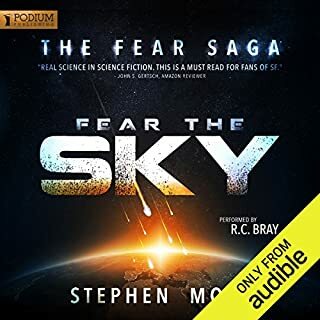 Now i know the first audio book was a little tough to swallow just because it jumped from Kublar to the story of Prisma, Indelible 6, Tyrus Rex and so on without warning. it seemed really odd to me to. However, i feel as if it was split like this on purpose rather than just plain bad writing. The characters each get introduced in unrelated story arcs in the first book then this one comes along, slowly weaving the 2 separate stories from the first. 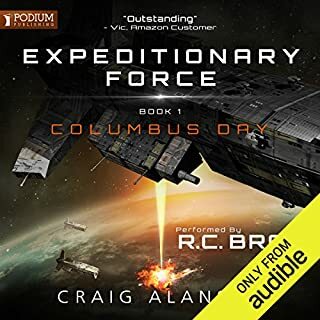 Also i've read a few complaints that the first portion of this audio book was also difficult, especially the "You are Tom" part. To be honest, i think it worked well because it seemed like brain washing, constantly Tom this Tom that, you could feel the characters struggle, the fighting between his humanity and the mission. The personality clash and eventual blur of deep undercover work. At one point i swear he would've gone rogue. As for the 2nd part of the Audiobook, well, i swear i could see the invasion play out in front of my eyes. The lies, the deceit, the political play all building to the end game. Also the combat, my goodness, you can feel the rush the soldiers are experiencing. I personally think this book would make for a bomb series or even an epic block buster movie though yeah at some point you can see some star wars-esque situations play out. All in all i very much enjoyed the book, and as always RC Bray takes the cake. Peace out. book 1 set the scene and though the jumping in story time line was challenging initially it worked and came together in book 2. can't wait to listen to book 3 now. as ever narration was excellent and made this book come to life - thank you R.C. 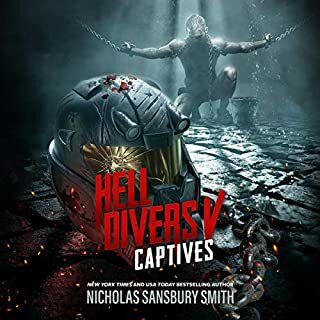 I love this book from start to finish the combat was awesome and the narrator did a great job with the narration of this book. 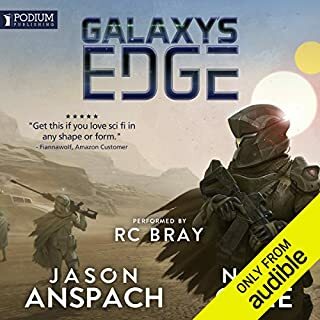 This is shaping up to be everything good from Star Wars rolled into a Galaxy spanning Space Opera, with intrigue many characters, hear the epic battles as seen from the eyes of those involved on both sides. I just need more now, RC Bray needs to keep the pace up because I can not wait for more! The plot for this two part novel was well rounded, meticulously crafted and and connected to past events expertly. There were many moments I’d hear word of another character from the previous story and get excited to hear what they had been up to. Characters were developed and relatable though on occasion the author would channel Alex Jones and we’d have a combat pilot musing to themselves about how much they disliked SJWs just before a pitched dogfight. It felt a little forced and out of place but it only happened a few times and the rest of the story more than made up for those moments. All in all, totally recommending to my friends. ...in both story and enjoyment. 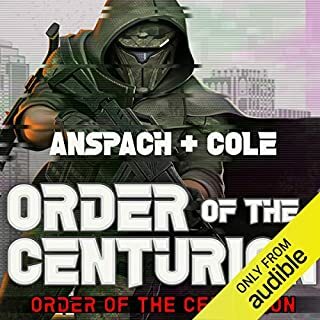 Cant wait for book 3 on Audiobook. RC Bray brings these stories alive so well. If you liked the first one you'll love this - because that's what Tom likes, books like this. Lots of jumping around in part 2. The story line during the battle is frankly all over the place. Still the characters are interesting. Loving this military style book. I love how you see the characters evolve over the series. Once again the narration is excellent. Straight on to number 3 for me! Lots of logic issues, such as stabilizer not working and still flying a successful air strike. Wait, what? Mumbossa is a super hero! Flying across gaps, finding the only spot on the outside of a warship NOT armored... ugh, too many super feats to suspend disbelief. All the bad guys gotta do is send mubossa with Kat flying to the republic as a missed and bam! game over. baaahhh.